The PDF file format is the world's most important file format in our world today. Since its creation in 1993, the PDF file format gone a long way (and survived the test of time), to become to most widely used and popular file format for documents today. This is unlike most file formats created before the 2000s that had set out to conquer its respective domains but failed. Take for example, .wave (1992), RealAudio (1995), and .wpd file format (1980s). Today, PDF is still the most widely used and most transacted file type in the world, and is still used in business, government, and even day to day such as when you scan and email documents. There are tons of advantages to using the PDF file format- some that you may already know, and some you completely do not realize. Think you are an expert on PDF file format and know everything about it? Here are the the 8 biggest advantages of using the PDF file format you probably did not know about. If you did not already notice this, PDF files look exactly the same whether you open them on a desktop computer, on an iPhone, or even on a external printer or copier machine device. The result of that endeavor is the PDF file type, which does a beautiful job in allowing documents to look consistently the same across different devices. PDF files are actually very small in size and compact by nature. You may disagree with this, and say "That is not true! My two page essay in PDF is way bigger than I expected!" There are several reasons why PDF files could end up dis-proportionally large. But generally it comes down to the way the amount of styles and images you added to the document. The images and fonts you add to the document are stored within the PDF file. This is something that most people do not realize. For example, if you make of use multiple fonts in your PDF document, each individual font could result in an additional 300-600 KB in file size. The reason for this is- the actual font file is stored within the PDF document. If you add images to the PDF file, it will similarly also cause the PDF file to inflate. However, saving the actual font and image in the file means that enjoy the benefit of seeing the actual font or image the document was created with. Carrying on from point #2- If you want to know how to shrink a PDF file? You could actually do this by first inspecting what goes into your PDF file. To inspect and understand your PDF file, do the following: 1. Use Adobe Acrobat, which has an in-built feature to inspect the internals of your PDF file. 2. Open a PDF document and select "File -> Save As Other -> Optimized PDF..." 3. Then, click on "Audit Space Usage..."
Here, Adobe Acrobat will display why your PDF file is so big by telling you the distribution between parts of the file that made up the entire file. 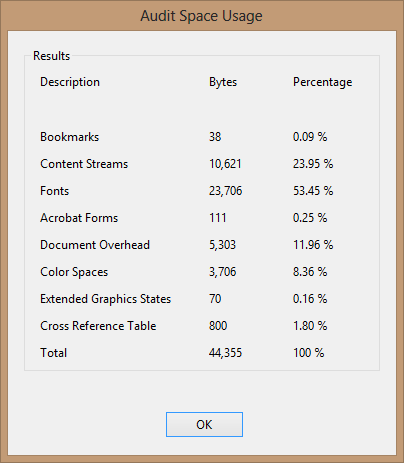 The example above shows that 53.45% of the total file size are used by fonts, and only only 23.95% is used by actual text content. Therefore, if you were to cut down and use only one font, and perhaps even a standard font type, you can cut the file size down by a good 20-30% or more. You may realize quickly after receiving a PDF file that you cannot edit it. How do I edit a PDF file? The answer is you cannot edit a PDF file, and that is exactly what PDF files was designed to combat- unauthorized edit and modification after it was first created. PDF files leave an audit trial whenever they are modified. Once you try to meddle with one, your activity will be added to the file and cannot be removed or erased. Therefore, we urge you not to try to modify PDF files. If you really need to modify a file sent from a customer or client, you can ask him to send you the original file and modify that file instead. What this all means is PDF files become very trustworthy documents that are suitable for use in business and government transactions. Isn't that just fantastic? Most operating systems support opening and viewing of PDF files now. Simply double-click on the file and it just opens. No need to download and install other external programs or document viewers. In fact, that was exactly what PDF file was again created for. You can create, send, open, and view across devices and operating systems, hassle-free. Do you know you could even create PDF files directly using your mobile phone? ee how you can scan documents and create PDF files directly from your iPhone or iPad. PDF is a flexible and powerful in its support for image components. You could paste any type of picture, image, shape or vector graphic you want and it will appear completely to the viewer as intended. With PDF, you can read or view documents without issues of incompatibility or unsupported image file types, that you may find common when opening uncommon file types like .odt and .ods using Microsoft Word. PDF's supports the for images mean that pictures and photos appear 100% of the time, looking 100% original when someone opens your PDF. Being the world's most used file type for documents, almost every document or image processing software has included support for simple creation of PDF files. In most software, you could simply click on Save as -> PDF to create PDF files. Need to do this on a mobile phone? It is equally easy for you to create PDF files using a document scanner app on an iPhone. PDF files support the security feature of Password Protect. This is something many organizations today cannot live without. After sending out a document, to ensure that it is only seen and opened by something that you intended to, you could password protect the file. After password protection, the user will be prompted to enter the password every time that he tries to open or preview the file. There is no way to open or reverse engineer the file to bypass the password protection in PDF at this point of time. Other advantages of PDF file format? Overall, the advantages of PDF file format makes it the perfect choice of file format for forms, documents, invoices and receipts. PDF files are so widely used today due to its ease of viewing, that you could seamlessly share it with someone. You could simply receive a PDF file from someone, double-click on it to launch the file and have it in front of you in seconds. There is no need to install any additional programs. People do not realize how magical this is, but they could simply send a file to someone without worrying whether they had the same type of computer, type of operating system, or whether they added certain text or images to the document that were not supported. Furthermore, it basically allow users to view it according to how it was intended to look by the author, "down to the pixel". That was our top 8 most important advantages of PDF file format that you probably did not know. Missed out something that you know? Share with us your favorite advantages of PDF files in the comments below.